Dino Zoff was arguably the best goalkeeper of his generation – many still claim he is the best they have ever seen – who’s introduction to the world of Serie A clubs was not a pleasant one: at tender age of just 14, Zoff was readily passed over by Inter Milan and Juventus for being “too short”. Five years later, following an apic growth spurt where he gained almost 33 cms (more than 13 inches) in height, Zoff would make his debut for Udinese. Never a giant by modern standards, at exactly 6 feet tall, Dino Zoff proved to the world he could more than make up for that with phenominal agility and fitness that would see him last to become the oldest player ever to pick up a world cup winners medal, in 1982, having captained his native Italy to the pinnacle of world soccer in Spain. Zoff also collected an early winners medal in the 1968 European Championships despite having only appeared in the Quarter Final and having only worn his national shirt on four occassions in his life. 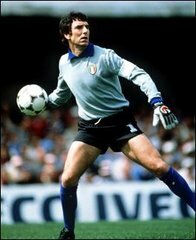 Dino Zoff was recently voted the third best keeper in history (behind the great Lev Yashin and Gordon Banks) a feat which his record (still standing) period of international football without conceeding a single goal: Zoff went 1142 minutes with a clean sheet – a period which lasted over two years, between 1972 and 1974 (ending inauspiciously against the minnows, Haiti, in the 1974 World Cup!). Zoff set many appearance records (which have since been broen) including appearing 570 times in the Italian top flight Serie A division for Udinese, Mantova, Napoli and Juventus (for whom he appeared 330 times in total, winning the Serie A championship an incredible six times). Is there a posibility for making a younger set, like for example 1968-1975?